For over six years they rocked Broadway and millions of fans in a ground breaking musical… These stars have collectively performed over 2,000 performances of the 5-time Tony Award nominated show; including the long running Broadway production, the critically acclaimed national tour and/or one of the amazing international companies. 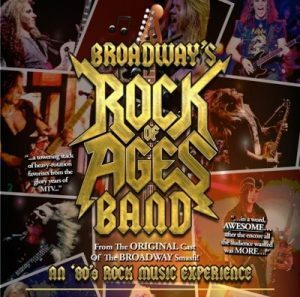 Rock of Ages is known as “Broadway’s Best Party” and BROADWAY’S ROCK AGES BAND was built around that party and the rock hits from the glam, metal bands of the ‘80’s, including songs by artists such as Bon Jovi, Foreigner, Journey, Whitesnake, Poison, Joan Jett, Styx, Pat Benatar, REO Speedwagon, Twisted Sister, Quiet Riot and many more! In fact the musicians in the show have played with, or currently play with many of these Artists, as well as performed them on Broadway. The concert appeals to the largest active market today. This band “…delivers the party and rockin’ memories…” and they’ve delivered it around the world. **Now, for the first time, we’re taking the band, the excitement and their energy on the road to perform those monster hits from the Broadway show, IN CONCERT, for audiences everywhere! Don’t miss the chance to see and hear this thrilling performance of hits. (“They are destined to last for years…”). We’ve arrived at the eighties and we’re not looking back!!! Broadways Rock of Ages Band. This is not the stage musical.